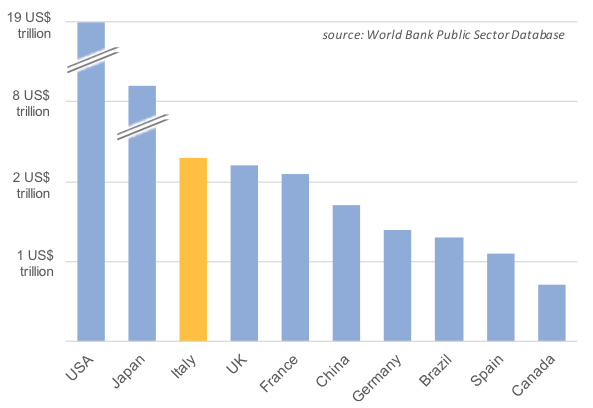 Italy stands out among developed countries for its large public debt and chronically low productivity growth. The country’s productivity growth disease cannot be addressed without understanding why aggregate labour productivity abruptly stopped growing around 1995. This column argues that the most likely cause is Italian firms’ non-meritocratic managerial practices, which meant they failed to capitalise on the ICT revolution. On 26 October 2017, Mario Draghi announced the ECB’s decision to scale back its bond purchase programme from €60 billion to €30 billion starting from January 2018, and to simultaneously extend the programme. While overall in line with markets’ expectations, the ECB’s decision is seen by many as the ‘beginning of the end’ of one of the most ambitious monetary stimulus programmes ever. One country which has benefited particularly from ECB’s commitment to asset purchases is Italy. The ECB’s activism has kept Italian government bond yields low and stable for a long time. But that will not last forever – as less accommodative monetary policy looms on the horizon, Italy will increasingly need to rely on growth fundamentals to sustain its public debt. Unfortunately, the fundamentals do not look good. 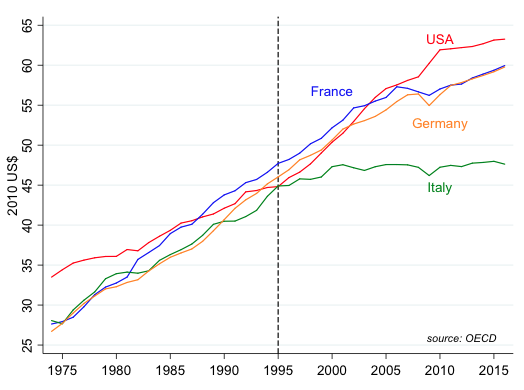 Not only was Italy severely battered by Europe’s double dip recession (its GDP is lower today than it was in 2005) but when we look at the growth of labour productivity (measured as GDP per hour worked, see Figure 1), we can see that Italy has been stagnating since the mid-90s. At the end of 2016, Italy’s central government debt was the third-largest in the world (Figure 2), at $2.3 trillion. With nearly twice the combined size of Lehman Brothers and Greece, a debt crisis in Italy could trigger a global financial catastrophe, and could very possibly lead to the disintegration of the Eurozone. To avoid such a scenario, Italy must revive growth – but to do that, it is crucial to understand why Italy’s labour productivity stopped growing in the first place. Italy’s productivity challenges have been outlined previously (e.g. Hassan and Ottaviano 2014), but our recent study is the first to tackle this issue organically (Pellegrino and Zingales 2017). The common limitation of previous analyses of this problem is that they focus on explaining growth in Italy alone using one variable. We argue that, for any ‘diagnosis’ to be valid, it cannot hold just for Italy, it must explain productivity growth across a sufficiently large cross-section of countries, and it must take into account alternative explanations. It is difficult, using country-level data, to unpack multiple potential causes of the productivity slowdown. For this reason, we use sector-level and firm-level data. We first ask which factor can best explain productivity growth across a cross-section of 18 countries and 23 industries over 1996–2006 and, at the same time, account for Italy’s productivity growth gap. Once we identify a plausible ‘candidate’ using sector-level data, we use firm-level data to corroborate our findings and address potential shortcomings of aggregate data. We start from a simple growth accounting exercise, using sector-level data from the EU KLEMS dataset. In this preliminary analysis, we confirm that Italy’s labour productivity slowdown is not due to a lack of capital accumulation, a failure to improve the mix of the labour force or the sectorial composition of the Italian economy. Italy’s labour productivity growth is largely driven by within-sectors growth in total factor productivity (TFP). Next, we turn our attention to a set of four ‘plausible’ shocks that might have affected Italian productivity around 1995. The first candidate is trade. The simultaneous creation of the euro and China’s entry to the WTO threatened Italian firms’ competitive position in world markets. While most recent trade theory suggests that a negative trade shock should have raised Italy’s aggregate productivity (by driving less productive firms out of the market), we also know from previous empirical studies (Frankel and Romer 1999, Alcalá and Ciccone 2004) that a country gains productivity by exporting more. It is therefore possible that the trade shock could have slowed down TFP growth if the overall international presence of Italian firms was reduced as a result. A second (related) shock is the increased need for flexibility of the labour force, induced by a combination of technology and globalisation (Dorn and Hanson 2015). Italy’s historically rigid labour market, which has been the target of policy recommendations by the IMF and the OECD, might have prevented the reallocation of labour units, adversely affecting its productivity (see Calligaris et al. 2016). The third potential explanation is an institutional shock. While Italy has long been known to lag behind other developed countries in terms of the quality of its institutions, some observers (e.g. Gros 2011) have noted that, starting from the mid-1990s, Italy experienced a sharp decline in government quality as measured by the World Bank’s Worldwide Governance Indicators. This decline might have caused Italy to fall further behind on the technological frontier. Finally, we consider the effects of the so-called ICT revolution. It has been extensively shown (e.g. Bresnahan et al. 2002) that, to fully exploit the benefits of ICT, firms should reorganise the working place using a performance-oriented, meritocratic management model. 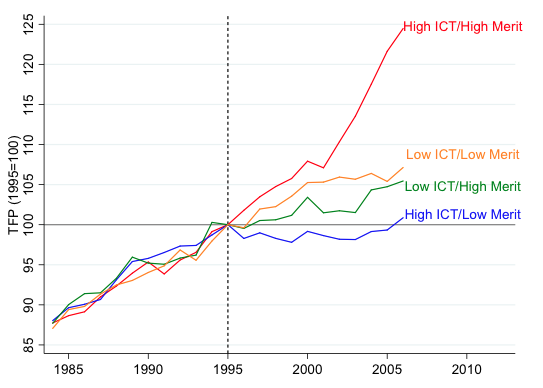 The interaction of ICT and the quality of management has already been shown by researchers to have determined the re-acceleration of US labour productivity vis-à-vis European labour productivity over the same period (Bloom et al. 2012). In other words, it is possible that Italy’s disease could be a more extreme form of this European disease. For each of these shocks, we construct an explanatory variable that varies across countries and sectors. Controlling for country- and sector-fixed effects, we test whether any of these factors can explain the cross-section of TFP growth. In particular, to investigate the ICT shock, we construct a country-level measure of meritocratic management based on expert surveys of the World Economic Forum. We find that only the last shock – the interaction of ICT and meritocratic management – successfully explains a significant fraction of the cross-section of TFP growth. This finding is shown in Figure 3. Countries where firms are more likely to follow a meritocracy-based management style experience faster productivity growth in sectors that are more ICT-intensive (based on the contribution of ICT capital to value added). We find that the combined effect of ICT and meritocracy explains more than half of Italy’s TFP growth gap (between 12.8% and 17.4% out of a total gap of 21.1%). Because we do not wish to rely exclusively on a perception-based measure of meritocracy, we corroborate our findings using firm-level data. Using survey data on governance and managerial practices of EU manufacturing firms from the EFIGE dataset (Altomonte and Aquilante 2012), we construct a firm-level measure of meritocratic management which ranges from 0 to 5. The distribution of this statistic is strikingly different for Italian firms with respect to the other countries in our sample (Austria, France, Germany, Hungary, Spain, and the UK). The average value is 0.98, half a standard deviation removed from the cross-country average of 1.61 – interestingly, nearly half of the Italian firms score zero. Additionally, firm-level survey data allow us to construct a measure (ranging from 0 to 3) of the extent to which managers use ICT to optimise production and distribution. 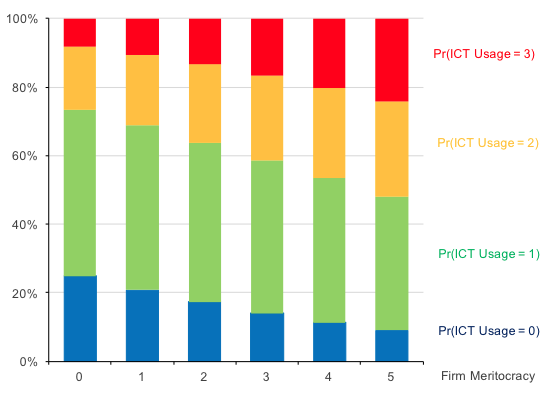 Concordantly with our sector-level empirical findings, we find our firm-level, non-perception-based measure of meritocracy predicts TFP growth and ICT usage across firms, particularly when interacted with a measure of ICT intensiveness. Figure 5 displays graphically the effect of meritocracy on ICT usage. There is one last question that we address in our paper. If loyalty-based management (the opposite of meritocracy-based management) imposes such a burden in terms of productivity, how can it possibly persist for so long among Italian firms? The answer to this question is complex, and we do not claim to have a conclusive answer. However, we provide suggestive evidence in the concluding section of our study that meritocratically managed firms face more obstacles in Italy than they do in other European countries, particularly when it comes to dealing with public bureaucracy or obtaining credit. These last findings suggest that a tentative policy prescription is for Italy, to remove those institutional barriers (such as corruption, judicial inefficiency and government interference in the financial sector) that stifle merit and contribute to cronyism. Alcalá, F, and A Ciccone (2004), “Trade and productivity”, Quarterly Journal of Economics 119, (2), 613-646. Altomonte, C, and T Aquilante (2012), “The EU-EFIGE/Bruegel-Unicredit dataset”, Bruegel Working Paper, no. 2012/13. Bloom, N, R Sadun, and J Van Reenen (2012), “Americans do IT better: US multinationals and the productivity miracle”, The American Economic Review 102 (1), 167-201. Bresnahan, T F, E Brynjolfsson, and L M Hitt (2002), “Information technology, workplace organization, and the demand for skilled labor: Firm-level evidence”, Quarterly Journal of Economics, 117 (1), 339-376. Calligaris, S, M Del Gatto, F Hassan, G IP Ottaviano, and F Schivardi (2016), “Italy’s productivity conundrum. A study on resource misallocation in Italy”, no. 030, Directorate General Economic and Financial Affairs (DG ECFIN), European Commission. Dorn, D, and G H Hanson (2015), “Untangling trade and technology: Evidence from local labour markets”, Economic Journal, 125 (584), 621-46. Frankel, J A, and D Romer (1999), “Does Trade Cause Growth?”, American Economic Review, 89 (3), 379-99. Gros, D (2011), “What is holding Italy back? ”, VoxEU.org, 9 November. Hassan, F, and G Ottaviano (2013), “Productivity in Italy: The great unlearning ”, VoxEU.org, 30 November. Pellegrino, B, and L Zingales (2017), “Diagnosing the Italian disease”, NBER Working Paper no. w23964. Pinelli, D, I Székely, and J Varga (2015), “Italys productivity challenge”, ECFIN Economic Briefs.